When I was selecting and sorting out items that I could include in this week’s Ebay bargains post, I can surely say that I was very inspired by the amazing heatwave outside these last two days ( which by the way I enjoyed to the fullest!) 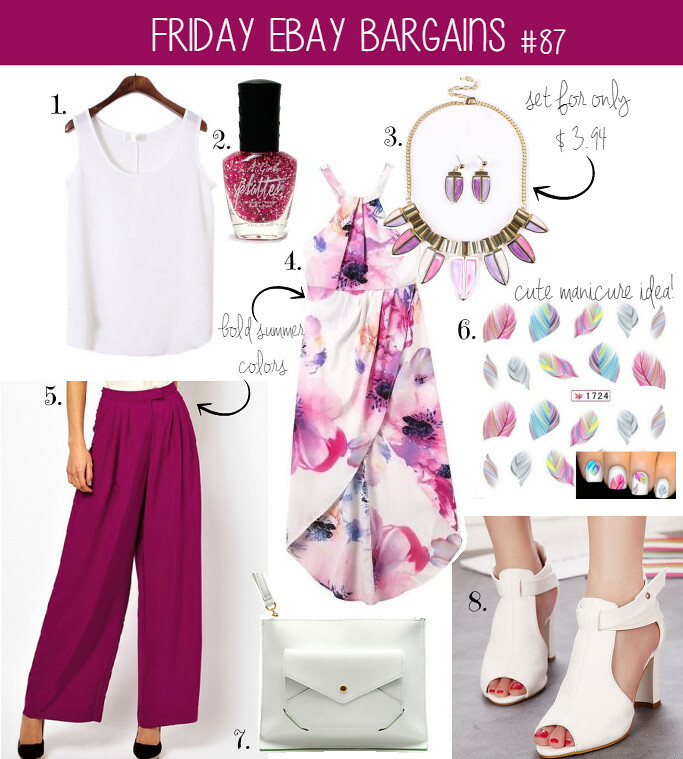 and I included some items in a really bold and summery color- purple! In order to not allow the vivid purple to take over the whole outfit I decided to mix it with white which is a color that goes with practically anything! White color, by the way, is definitely my most worn color this summer and I adore how amazing it looks against sun kissed skin! These pants for me are surely the number one item in this Ebay collage as not only I love the color about which we talked previously, but also the effortless, flowy design! I have always wanted wide leg pants that “move” with you with every single step you take! Plus, they are available in the classy black color as well! What is your summer’15 must have item? Iespaidojoties no fantastiski karstās vasaras dienas, kuru šodien izbaudīju pilnībā atrodoties vecvecāku lauku mājās, šajā Ebay rakstā es nolēmu iekļaut ļoti sulīgu un vasarīgu krāsu jeb košo purpuru! Lai koptēls nebūtu pārāk kliedzošs nolēmu papildināt/atšķaidīt šo košo krāsu ar vienmēr visam atbilstošo balto, kas, starp citu, manā garderobē vasarā ir viena no valkātākajām krāsām! Dievinu kā baltais izskatās uz nosauļota, nedaudz bronzīga auguma! Esmu lielā sajūsmā par biksēm, kuras iekļāvu šīs dienas rakstā, jo mani uzrunā ne tikai jau iepriekš pieminētā krāsa, bet arī klasiskais piegriezums, kas ir kā radīts vasarīgām pēcpusdienām un vakariem! Vienmēr esmu vēlējusies brīvi krītošas bikses, kas “kustās” uz katra soļa! Starp citu tās ir pieejamas arī klasiskajā melnajā krāsā! Kura ir Tava šīs vasaras “must have” lieta? Thank you! And yessss, I am kind of obsessed with the necklace myself! I love the gorgeous print of the dress the most & I agree the price is definitely very compelling when it comes to that top! A true bargain! This deep purple makes me think of fall! I'm sure it'll be here before we know it! My most-worn item this summer has been my "boyfriend" jean shorts, they are so comfy! I definitely see what you mean about resemblance to fall, but I kind of see more summer in the color as it reminds me of forest berries- blueberries and blackberries! I don't have boyfriend type shorts, but I can imagine how comfortable they could be! I am thinking of ordering those stickers as they are ridiculously cheap and could be a cute summer accessory! Yes, you definitely should find them, I would surely love to see an outfit post with them!